Don't let irritating and painful bites spoil your summer. 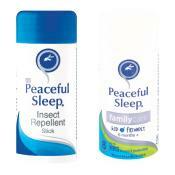 Protect yourself with Peaceful Sleep Insect Repellent. 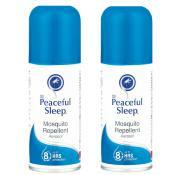 Peaceful Sleep is a clean, clear aerosol proven to protect your skin against bites from mosquitoes, midges, flies, ticks and fleas. 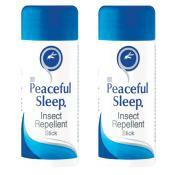 Manufactured in South Africa and trusted by safari rangers, this is one of the best repellents on the market. Non-greasy and non-sticky, it allows the skin to breathe, making it very suitable for sensitive skin prone to irritation. Providing protection against bites for 8+ hours, it's long lasting, extremely effective and not unpleasant to use. 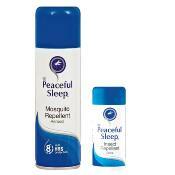 Peaceful Sleep original contains 15% DEET and is available in a 150ml aerosol spray, as well as a mini 85ml size which is perfect for hand-luggage only travel or carrying in your bag or pocket. 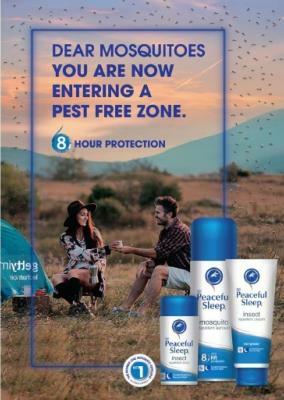 Great for every type of leisure activity, including hiking, camping, fishing and running as well as keeping pesky insects at bay when holidaying abroad. Also available in a stick format for targeting specific areas such as ears, neck, wrists and ankles. 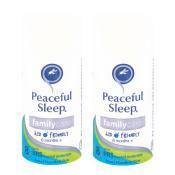 Have a look, also, at the Peaceful Sleep Family Care Insect Repellent Stick. This is a DEET alternative product, containing natural oils proven to repel insects, such as citronella and lemongrass and is suitable for babies from 6 months and young children up to the age of 12. Combine this with one of our colourful DEET-free anti-mosquito bands and you can rest assured that your children will remain bite-free. Bands can be worn on the ankle, wrist or even tied to a bag or buggy handle. Each pack contains 10 bands and each band will last for 200+ hours. If you want to combine an insect repellent with a sunscreen, have a look at our Techniblock SPF 40 75ml sprays containing citronella, a natural deterrent against bites. A natural, citronella-impregnated colourful band to keep mosquitoes away.